Orlando Retirement Villa For Sale in Polo Park West!! Orlando Retirement Villa For Sale – Every once in a while THE home comes on the market….and here it is! Location! Location! Nice layout. Well maintained. FURNISHED. THREE bed/two bath home ON THE GOLF COURSE in this established 55+ community. Laminate flooring spans the living room, kitchen, dining room, and hallway. The guest bedrooms are situated on the opposite side of the master suite offering lots of privacy and space between you and your guests. Nice size kitchen/dining area leading out to the 12×16 Florida Room (w/wall a/c) overlooking the golf course. A/C 2006, roof 2014, and new hot water heater 2018. TWO car driveway, 7×10 attached storage shed, and great orange tree and lemon tree! 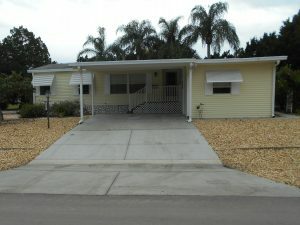 Located close to Disney, the theme parks, restaurants, and shopping. Polo Park offers 2 heated pools, short 9 hole golf course, two clubhouses, shuffleboard, tennis, horseshoes, bingo, and much more. Low HOA fees ($560/YEAR). You own the land! I think YOU will love this home!